I love lotions of all kinds. So I was excited when I was asked to review Skin MD Natural Lotion. 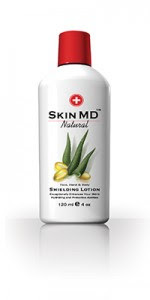 Skin MD Natural is a shielding lotion, a breakthrough in skin care technology. It bonds with the outer layer of skin to form a new protective layer that locks in natural moisture, protects against chemicals and other impurities, and lets the skin heal itself. Skin MD Natural is Dermatology tested. And some things I also like about it is that it does not contain animal products and is not tested on animals. That has always been important to me. Another thing I like about it is that it is fragrance & colorant free. It is also hypoallergenic. I like the fact that it is fragrance free, because although I like lotions with scents, there is also sometimes when I don't want any fragrance. Especially since Skin MD can be used on your face, hands and body. I love putting lotion on my face, but don't want it to smell. So the Skin MD is actually perfect for that. It also is very quickly absorbed into your skin and doesn't feel oily or greasy. Mandatory Entry: Visit the Skin MD site and tell me something you learned there. RULES: Giveaway is open to US Residents only. Giveaway ends December 5, 2009 at 11:59 PM. Winner will be chosen via Random.org. Winner must have valid email in their blog profile or leave email in comments otherwise you will be disqualified. Winner will have 48 hrs. to confirm by email, If no confirmation in that time frame a new winner will be chosen. Disclaimer: Skin MD provided me with the bottle of lotion, at no cost to me, for the sole purpose of reviewing it and offering it for a giveaway. The opinions expressed are my own and are not influenced by monetary compensation. I learned that Skin MD Natural has a moisturizing factor of at least 6 times greater than glycerin. I didn't know that Skin MD had "moisturizing factor of at least 6 times greater than glycerin". Shielding lotion blocks irritants and keeps moisture in! I learned that they also have SkinMD with an SPF factor for shielding the sun in the summer months too! I love that it only takes a few days to see the benefits. I'd love to try this on my daughter's exczema. I learned "A shielding lotion keeps moisture-robbing irritants away from the skin while the proprietary "super" humectants hydrate the skin throughout the day. ", so it is different from a regular skin lotion. Skin MD products are absorbed and retain moisture 6 times better than products that contain glycerin! Wow...that's an impressive claim. I would love to try it! Thanks for the opportunity...great giveaway! My hubby could use this. I learned that the proprietary formulation in Skin MD Natural has a moisturizing factor of at least 6 times greater than glycerin. I learned that it doesn't rub or wash off easily! I learned that An accumulated effect of Skin MD Natural is fully realized after only a few days of daily use. I learned that it corrects dry skin by sealing in the moisture rather than just adding moisure to the surface. I learned that Skin MD moisturizing factor is at least 6 times greater than glycerin. Thanks!